Add this loveseat to your living room for a casually stylish look. Plush pillow arms and seat and back cushions provide supportive comfort, while contrast stitching elevates the look with tailored detailing. Block legs complete the loveseat for a look that suits casual and transitional living room decor. 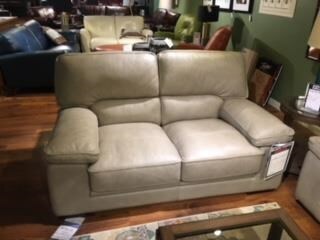 The 10105 Casual Loveseat with Pillow Arms by Futura Leather at Dunk & Bright Furniture in the Syracuse, Utica, Binghamton area. Product availability may vary. Contact us for the most current availability on this product. Come home to a living space that invites you to relax with this seating group. Each stationary seating option offers padded pillow arms and plush seat and back cushions for a look that exudes luxurious comfort. Contrast stitching provides a tailored element for a touch of class on an otherwise casual appearance. The 10105 collection is a great option if you are looking for Casual furniture in the Syracuse, Utica, Binghamton area. Browse other items in the 10105 collection from Dunk & Bright Furniture in the Syracuse, Utica, Binghamton area.